Lukas Podolski set for Arsenal return Arsenal German attacker Lukas Podolski is likely to return to Arsenal at the end of the season after failing to cement his place at Inter Milan. Arsenal German attacker Lukas Podolski is likely to return to Arsenal at the end of the season after failing to cement his place at Inter Milan. The recent reports in Italy claim that the Gunners star Lukas Podolski is expected to return to Premier League in the summer. Inter Milan signed him last month on a loan deal for the remainder of the season with an option to buy him on a permanent deal. Podolski’s struggling season at the Gunners was the major reason of his move but the German star is also struggling in the Serie A. he has made six appearances since his move from London. The 29-year-old was left out from Europa League squad last month which is the frustrating news for the World Cup winner. 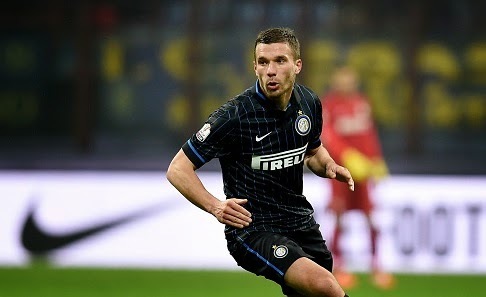 Inter Milan were keen to make his move permanent in the summer but it will now depend of Podolski’s if he wants to continue in Serie A or want to return to homeland. Meanwhile, Tuttosport reported that Inter could also allow him to leave as he has not impressed the boss Roberto Mancini in his few appearances. Podolski has not find the back of the net in his four Serie A starts.